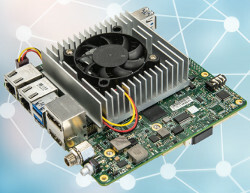 Aitech, which has been producing embedded Linux-driven systems for military/aerospace and rugged industrial applications since at least 2004, announced that Concurrent Real-Time’s hardened RedHawk Linux RTOS will be available on two Linux-ready embedded systems based on the Nvidia Jetson TX2 module. With Redhawk Linux standing in for the default Nvidia Linux4Tegra stack, the military-grade A176 Cyclone and recently released, industrial-focused A177 Twister systems can “enhance real-time computing for mission-critical applications,” says Aitech. (click image to enlarge)Here, we’ll take a closer look at the A177 Twister, which was announced in October as a video capture focused variant of the similar, MIL/AERO targeted A176 Cyclone. Both of these “SWaP-optimized (size, weight and power) supercomputers” are members of Aitech’s family of GPGPU RediBuilt computers, which also include PowerPC and Intel Core based systems. We’ll also briefly examine an “EV178 Development System” for an Nvidia Xavier based A178 Thunder system that was revealed at Embedded World. The A178 Thunder targets MIL/AERO, as well as autonomous vehicles and other applications (see farther below). 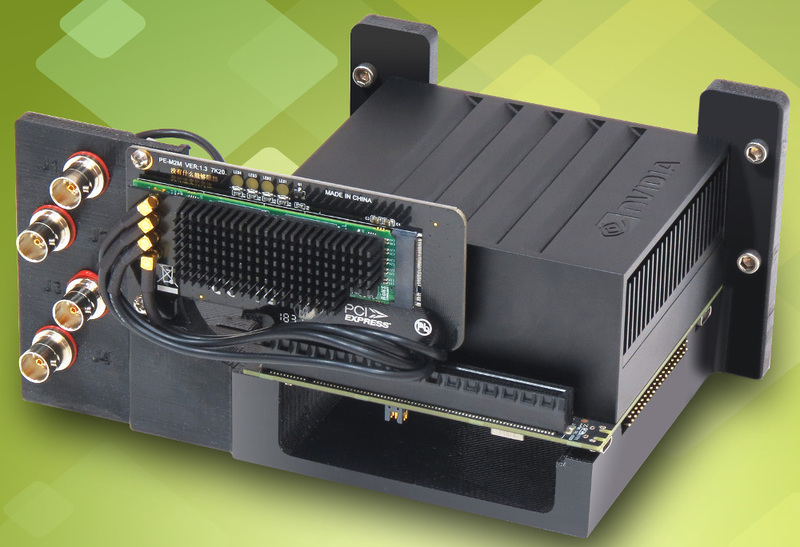 Both the A177 Twister and A176 Cyclone systems deploy the Arm-based Jetson TX2module in a rugged, small form factor (SFF) design. The TX2 module features 2x high-end “Denver 2” cores and 4x Cortex-A57 cores. There’s also a 256-core Pascal GPU with CUDA libraries for running AI and machine learning algorithms. (click images to enlarge)The TX2 module is further equipped with 8GB LPDDR4 and 32GB eMMC 5.1. Other rugged TX2-based systems include Axiomtek’s eBOX800-900-FL. The RedHawk Linux RTOS distribution, which was announced in 2005, is based on Red Hat Linux and the security-focused SELinux. RedHawk offers a hardened real-time Linux kernel with ultra-low latency and high determinism. 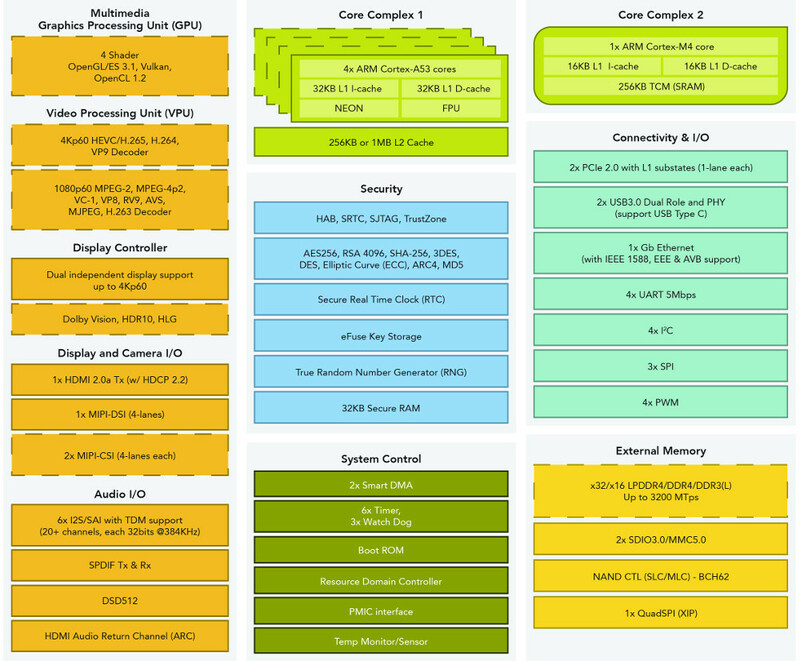 Other features include support for multi-core architectures and x86 and ARM64 target platforms. The RedHawk BSP also includes “NightStar” GUI debugging and analysis tools, which were announced with the initial RedHawk distro. NightStar supports hot patching “and provides a complete graphical view of multithreaded applications and their interaction with the Linux kernel,” says Concurrent Real-Time. 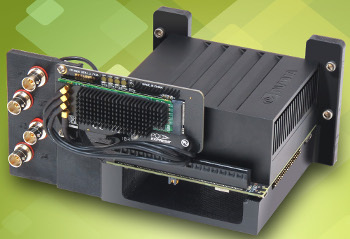 The A177 Twister leverages the Jetson TX2 and its “CUDA and deep learning acceleration capabilities to easily handle the complex computational requirements needed in embedded systems that are managing multiple data and video streams,” says Aitech. The system is optimized for video capture, processing, and overlays. (click image to enlarge)The A177 Twister supports applications including robotics, automation and optical inspection systems in industrial facilities, as well as for autonomous aircraft and ground environments,” says Aitech. Other applications include security and surveillance, mining and excavating computers, complex marine and boating applications, and agricultural machinery. The 148 x 148 x 63mm A177 Twister is protected against ingress per IP67. The fanless system weighs 2.2 lbs. (just under 1Kg) and supports -20 to 65°C temperatures. The system shares many features with the A176 Cyclone, with the major difference being that it adds optional WiFi-ac and Bluetooth 4.1, as well as support for simultaneous capture of up to 8x RS-170A (NTSC/PAL) composite video channels at full frame rates. It also has lower ruggedization levels and a smaller 6-24V input range compared to 11-36V, among other differences. (click images to enlarge)As shown in the spec-sheet above, you can purchase the Twister with and without 8x composite inputs and/or 1x SDI input with up to 1080/60 H.264 encoding. There’s also a choice of composite or SDI frame grabbers, both, or none at all. The one SKU that offers all of the above sacrifices the single USB 3.0 port. Standard features include USB 2.0, HDMI, Composite input, GbE. 2x RS-232 (one for debug/console), 2x CAN, and 4x single-end discrete I/O. Most of these interfaces are bundled up into rugged military-style composite I/O ports. Power consumption is typically 8-10W with a maximum of 17W. The system also provides reverse polarity and EMC protections, hardware accelerated AES encryption/decryption, temperature sensors, elapsed time recorder, and dynamic voltage and frequency scaling. Aitech revealed an A178 Thunder< at computer at Embedded World. The company recently followed up with a formal announcement and product page for an EV178 Development System that helps unlock the computer for early customers. 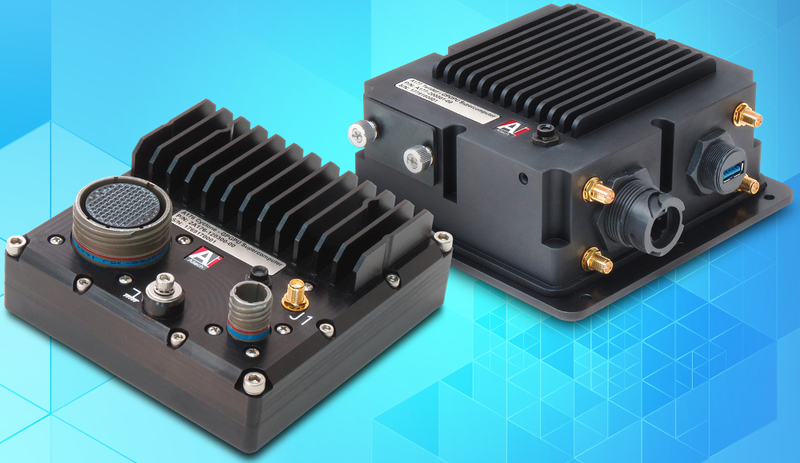 EV178 Development System for A178 Thunder (left) and Jetson AGX XavierBuilt around Nvidia’s high-end Jetson AGX Xavier module, the compact, Linux-driven A178 Thunder “is the most advanced solution for video and signal processing, deep-learning accelerated, for the next generation of autonomous vehicles, surveillance and targeting systems, EW systems, and many other applications,” says Aitech. 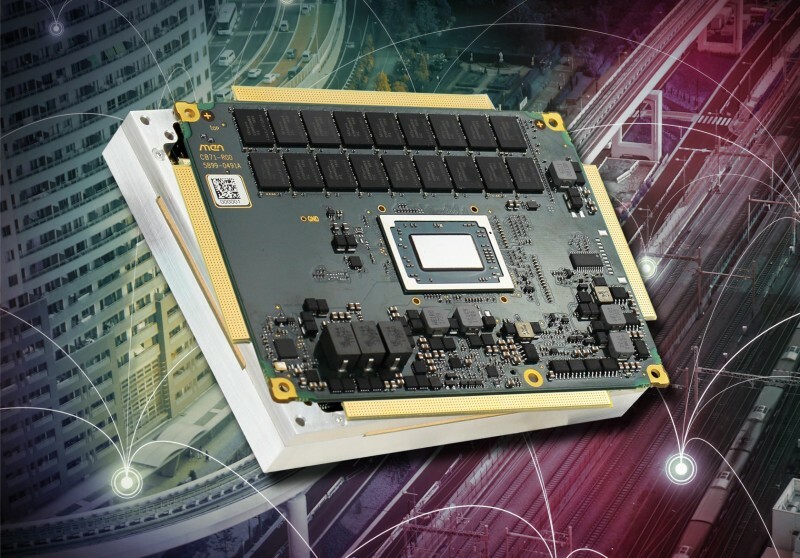 The EV178 Development System for A178 Thunder processes at up to 11 TFLOPS (Terra floating point operations per second) and 22 TOPS (Terra operations per second), says Aitech. The Jetson AGX Xavier has greater than 10x the energy efficiency and more than 20x the performance of the Jetson TX2, claims Nvidia. 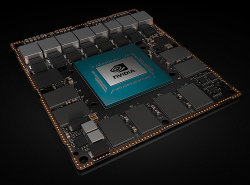 The 105 x 87 x 16mm Xavier module features 8x ARMv8.2 cores and a high-end, 512-core Nvidia Volta GPU with 64 tensor cores with 2x Nvidia Deep Learning Accelerator (DLA) — also called NVDLA — engines. The module is also equipped with a 7-way VLIW vision chip, as well as 16GB 256-bit LPDDR4 RAM and 32GB eMMC 5.1. 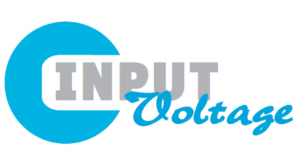 Concurrent’s RedHawk Linux RTOS appears to be available now as an optional build for the A177 Twister and earlier A176 Cyclone, both of which appear to be available with undisclosed pricing. No ship date was announced for the EV178 Development System for A178 Thunder. More information may be found in Aitech’s RedHawk Linux announcement, as well as the A177 Twister product page. More on the A178 Thunder may be found in the EV178 Development System for A178 Thunder announcementand product page. This article originally appeared on LinuxGizmos.com on March 18. Ibase’s new SI-626 digital signage and video wall (VW) player combines high-end functionality with a slim 30 mm height—1.5 mm thinner than its AMD Ryzen V1000 based SI-324 player. Like the SI-324, the SI-626 features hardware based EDID remote management with software setting mode to prevent display issues due to cable disconnection or display identification failures. players, the SI-626 supports Intel’s 7th Gen “Kaby Lake” Core processors, and like the IOPS-602, it also supports 6th Gen Skylake parts. The system supports 7th and 6th Gen chips with FCBGA1440 sockets and Intel QM170 or HM170 chipsets by way of a “MBD626” mainboard. The SI-626 can load up to 32GB of DDR4-2133 RAM and offers an M.2 M-Key 2280 slot for storage. There’s also a 2.5-inch SATA bay and an M.2 E-Key 2230 slot, as well as a full-size mini-PCIe slot for WiFi/BT, 4G LTE, and capture cards. The SI-626 is equipped with 6x HDMI 1.4 ports with independent audio output and “ultra-high resolution” support. You also get 4x USB 3.0 ports, 2x RS-232 serial ports with RJ45 connectors, and dual GbE ports (Realtek RTL8111G). 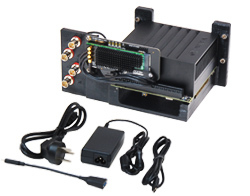 The system is further equipped with an audio jack, watchdog, mounting brackets, and 2x LEDs. The 290 mm x 222 mm x 29.9 mm, 2.2 kg signage player provides a 0 to 45°C range with 5 grms, 5~500 Hz, random vibration resistance (with SSD). A segregated ventilation system is said to reduce internal dust. The SI-626 offers a 12 V DC jack with a 150 W power adapter supported with Ibase iControl power management and Observer remote monitoring technologies. These work together to provide automatic power scheduling, power failure detection, and restoration to default state in the event of a system crash. You can even boot up the system “under low ambient conditions,” says Ibase. The SI-626 appears to be available now at an undisclosed price with a standard configuration of 16 GB RAM and a 128 GB SSD. 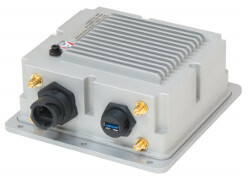 More information may be found at Ibase’s SI-626 product page. 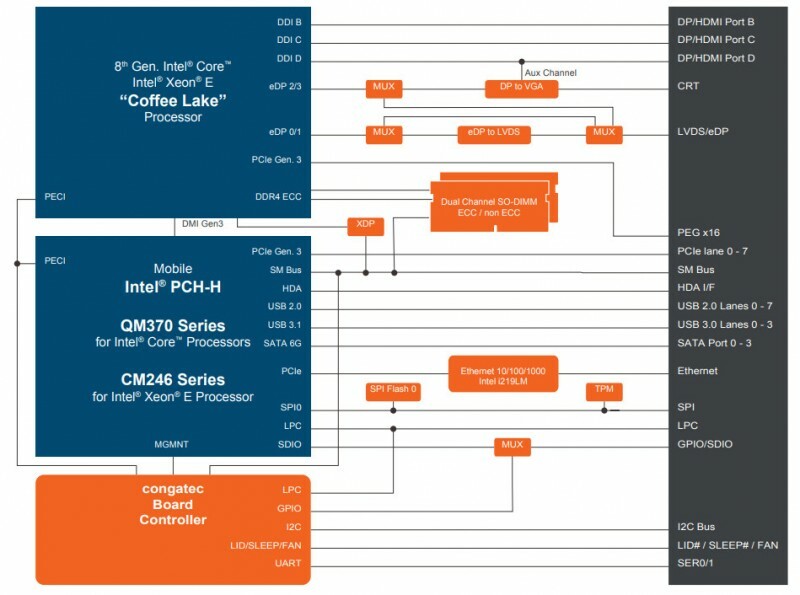 This article originally appeared on LinuxGizmos.com on September 20..
Intel has rolled out new H-, M-, U- and T-series Intel Core and Xeon chips, expanding its line of 14 nm fabricated, 8th Gen Core Kaby Lake Refresh processors, code-named “Coffee Lake.” Of special interest are four new dual- and quad-core U-series chips with up to 2.7 GHz clock rates and 28 W TDPs, as well as four quad- and hexa-core H-series Core i5 and i7 processors and a pair of hexa-core M-series Xeon chips, all with 45 W TDP (total dissipated power). The hexa-core Core i7-8850H, quad-core Core i5-8400H, and hexa-core Xeon E-2176M are appearing in a pair of 125 mm x 95 mm COM Express Basic Type 6 announced by Congatec and Seco. Both the Conga-TS370 and Seco’s COMe-C08-BT6 are available with Linux or Windows 10, and support 0 to 60°C temperatures (see farther below). Intel launched its first round of 8th-Gen Kaby Lake Refresh “Coffee Lake” chips back in September. This fourth generation of its 14 nm fabricated Core chips — following Broadwell, Skylake, and Kaby Lake — offers relatively modest performance and power efficiency improvements.Like most of AMD’s new Ryzen Embedded V1000 SoCs, most of the Coffee Lake processors are double threaded, so four cores give you eight threads and six cores give you 12. The exception is a line of standard, desktop-oriented T-series chips with 35 W TDPs. The T-series models are all single-threaded except the top-of-the-line, hexa-core Core i7-8700T, clocked to 2.4 GHz /4.0 GHz. The latest batch of U-series processors give you more speed, but higher 28 W TDPs than the original batch. The initial U-series chips, which were used in recent Linux-based laptops from System76 and ZaReason, provide slightly faster quad- instead of dual-core designs with the same price and 15 W TDP as 7th-Gen “Kaby Lake” models. The first round of Coffee Lake chips also included some high-end models tuned to gaming, as well as the first hexa-core Core i5 and first quad-core Core i3 models. Also today, Intel unveiled a new line of 300-series I/O chipsets that are based on the upcoming Cannon Lake PCH. The lineup includes a Q370 model that supports up to 6x USB 3.1 Gen2 ports, up to 24x PCIe 3.0 lanes, and Intel Wireless-AC for faster 802.11ac. Intel’s original line of 8th Gen CPUs (top) and new 300-series I/O chipsets (bottom) (click images to enlarge)Intel added to the Coffee Lake parade with some gaming focused G-series chips that use a Radeon Vega GPU from rival AMD. The Core i7-8809G, which can be overclocked, as well as the fixed rate Core i7-8705G, are available in Intel NUC mini-PCs.Today’s media coverage emphasized Intel’s first mobile version of its gaming-oriented Core i9 design. The hexa-core Core i9-8950HK CPU uses thermal velocity boost” technology to jump from 2.9 GHz to 4.8 GHz. All the models used by Congatec and Seco offer 45W TDPs and support Intel Optane memory and Intel VPro technology. As with other Coffee Lake processors, there are software patches to protect against Meltdown and Spectre vulnerabilities. However, a hardware fix will await the 10nm Cannon Lake generation. 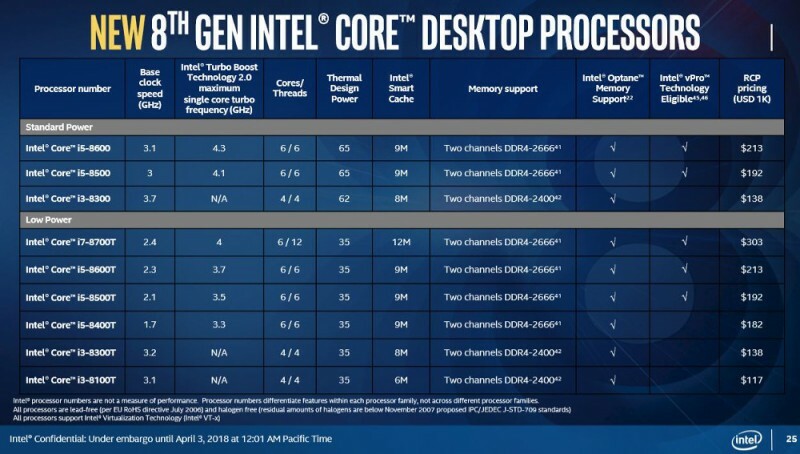 Intel claims that the six-core H-series and M-series modules offer between 45 to 50 percent more multi-thread and 15 to 25 percent more single-thread performance compared to 7th Gen “Kaby Lake” Core processors. The built-in Intel Gen9 LP graphics can manage up to 3x independent displays at once, with a resolution up to 4096 x 2304 at 60 Hz, 24 bpp. There’s support for DirectX 12 and OpenGL 4.5, as well as an H.265 / HEVC hardware transcoder. 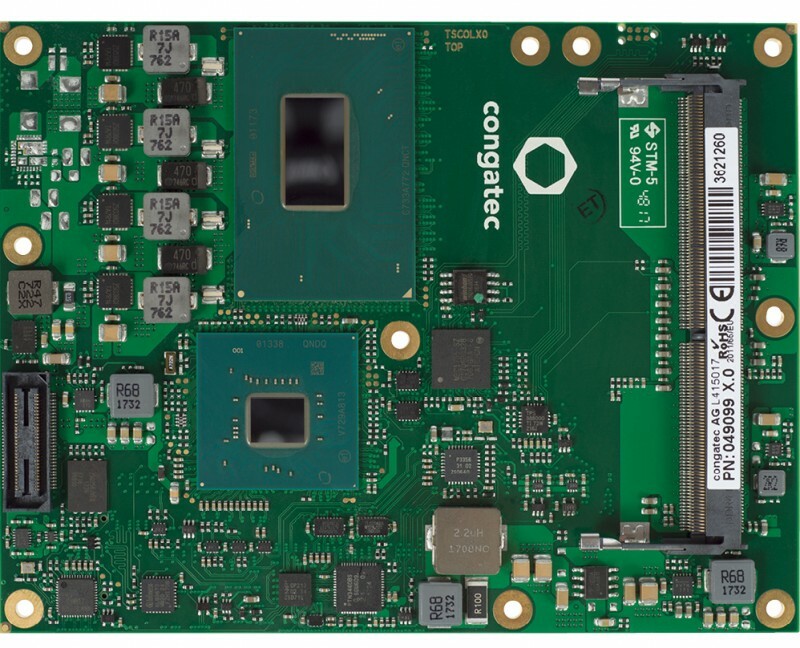 Like Congatec’s 6th Gen Skylake based Conga-TS170 and 7th Gen Kaby Lake powered Conga-TS175, the Conga-TS370 uses the COM Express Type 6 Basic form factor. All common Linux operating systems, as well as the 64-bit versions of Microsoft Windows 10 and Windows 10 IoT are supported. 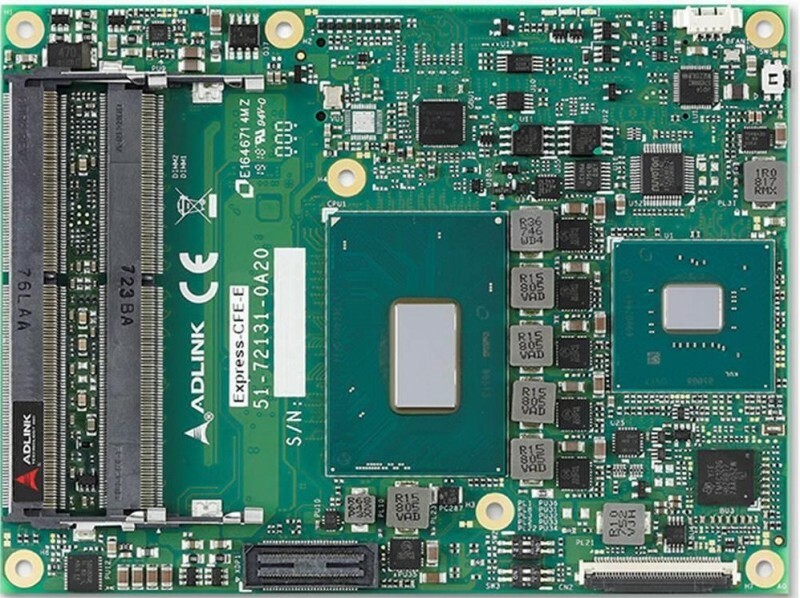 The module offers up to 10-year availability, and targets applications including “high performance embedded and mobile systems, industrial and medical workstations, storage servers and cloud workstations, as well as media transcoding and edge computing cores,” says Congatec.Thanks to the Coffee Lake-H chips, the module supports Intel Optane memory, as well as Intel Software Guard extensions, Trusted Execution Engine, and Intel Platform Trust Technology. 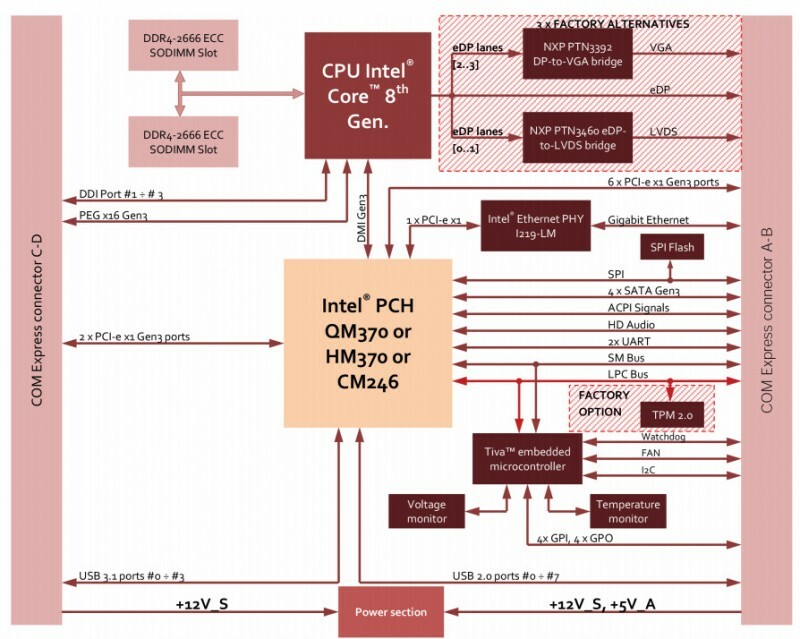 The Core processors use the new Intel PCH-H QM370 Series I/O chipset while the Xeon is paired with a CM246 Series controller. You can load up to 32GB of DDR4-2666 memory via dual sockets with optional ECC. There are 4x SATA III interfaces, as well as an Intel i219-LM GbE controller with AMT 12.0 support. Expansion features include a PEG x16 Gen3 interface and 8x PCIe Gen 3.0 lanes. The integrated Intel UHD630 graphics supports up to three independent 4K displays via HDMI 1.4a, eDP 1.4, and DisplayPort 1.2. 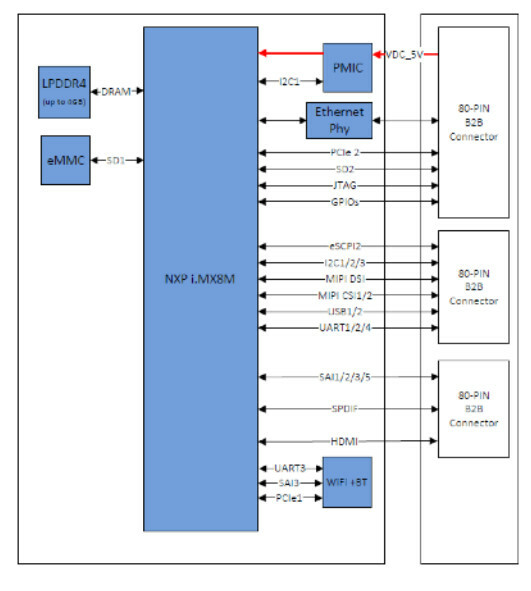 Dual-channel LVDS is also available as an alternative to eDP, and for the first time, you can switch between eDP to LVDS by software alone, says Congatec. The highlighted feature enabled by Coffee Lake-H is its support for up to 4x USB 3.1 Gen 2 ports, which operate at up to 10 Gbps. The module also includes 8x USB 2.0 interfaces. 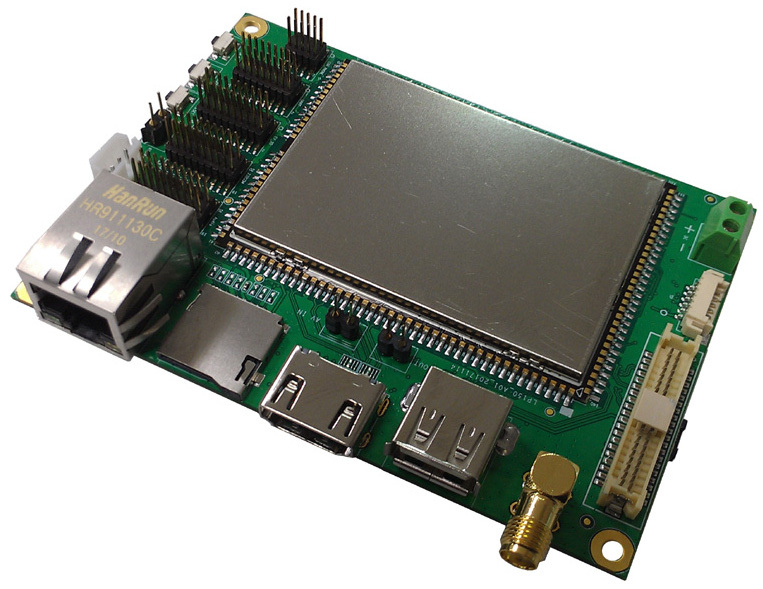 The Conga-TS370 is further equipped with LPC, I2C, SMBus, GPIO, SDIO, and dual UARTs. There’s also an HD Audio interface, TPM 2.0, and ACPI 4.0 with battery support. The Congatec Board Controller provides features including watchdog, non-volatile user storage, and backlight control. Support services are available, along with a range of accessories and standardized or customized carrier boards and systems. A Conga-Teva2 carrier is in the works but is not yet documented. 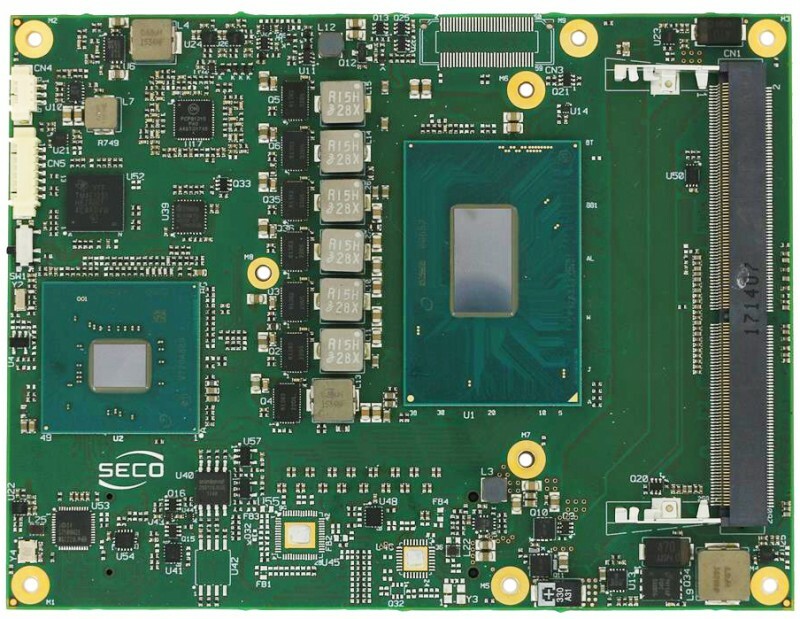 Seco’s COMe-C08-BT6 module, which follows it similarly Type 6, 6th Gen Skylake based COMe-B09-BT6, is designed for applications including gaming, signage, infotainment, HMI, biomedical devices, Industry 4.0, automation, and telco. There’s support for 64-bit Linux and Windows 10. Not surprisingly, the feature set is very similar to that of the Conga-TS370. You get up to 3 2GB of DDR4-2666 with ECC, 4x SATA 3.0 channels, and an Intel i219-LM GbE controller.The COMe-C08-BT6 has the same triple display and 4K support as the Congatec model. 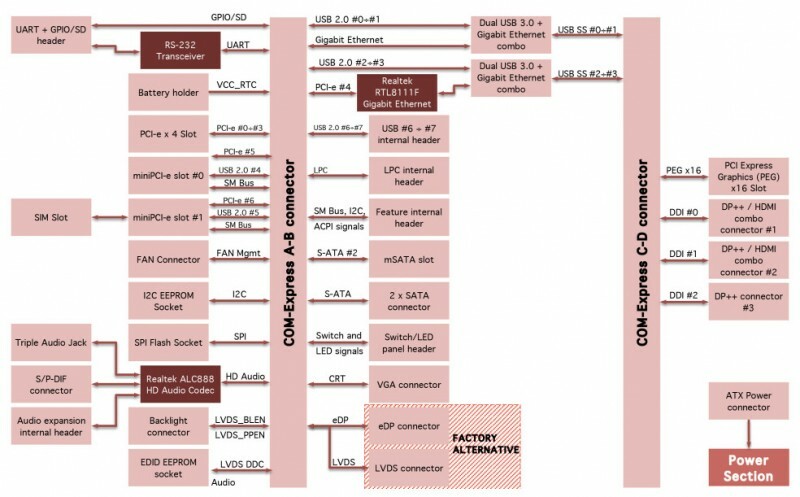 In this case you get DP, HDMI, and DVI DDI interfaces, as well as a choice of eDP, LVDS, or LVDS + VGA interfaces. HD Audio is also available. 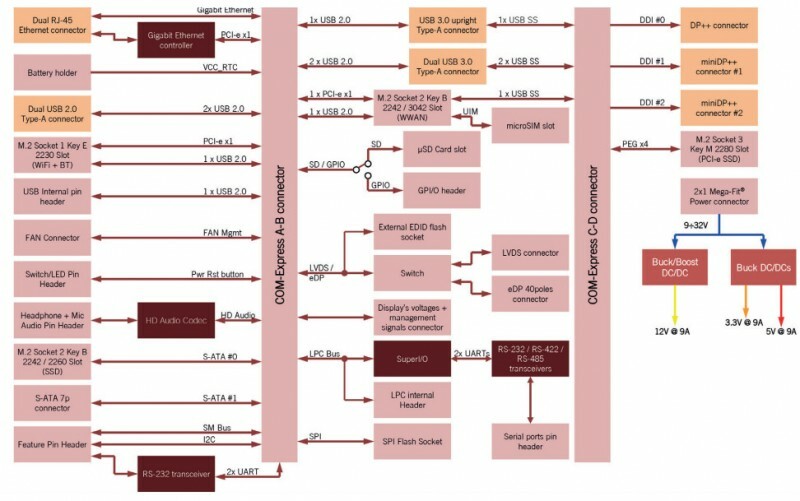 Like the Conga-TS370, there are 4x USB 3.1 Gen 2 interfaces, 8x USB 2.0 links, a PEG x16 Gen3 interface, and 8x PCIe Gen 3.0 lanes. 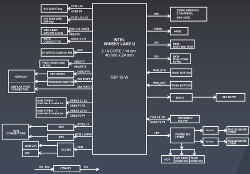 Other features include 2x UARTs, as well as SPI, I2C, SMBus, LPC, and GPIO. You also get a watchdog, optional TPM 2.0, thermal and fan management signals, and 12 V or optional 5 V DC input. 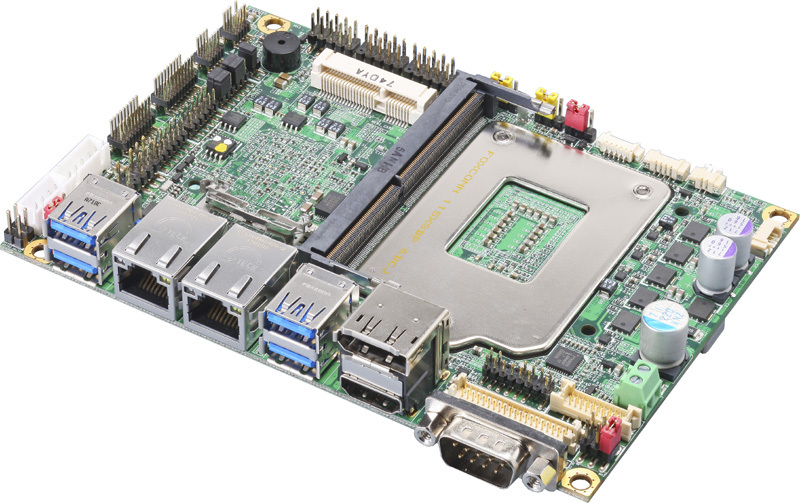 (click images to enlarge)The COMe-C08-BT6 is available with Seco’s CCOMe-965 Mini-ITX carrier board, which also supports other Seco Type 6 modules such as the COMe-B09-BT6 and Ryzen V1000 based COMe-B75-CT6. There’s also a Cross Platform Development Kit that includes the CCOMe-965, along with HDMI and DisplayPort cables, and is said to support ARM-based Type 6 COMs in addition to x86. No pricing or availability information was provided for the Congatec Conga-TS370 or Seco COMe-C08-BT6 Type 6 modules. More on Congatec’s Conga-TS370 module may be found in the Conga-TS370 announcement and product pages. More on Seco’s COMe-C08-BT6 may be found on the COMe-C08-BT6 product page. Intel’s latest Intel Coffee Lake processors should start shipping in volume by the end of the month. 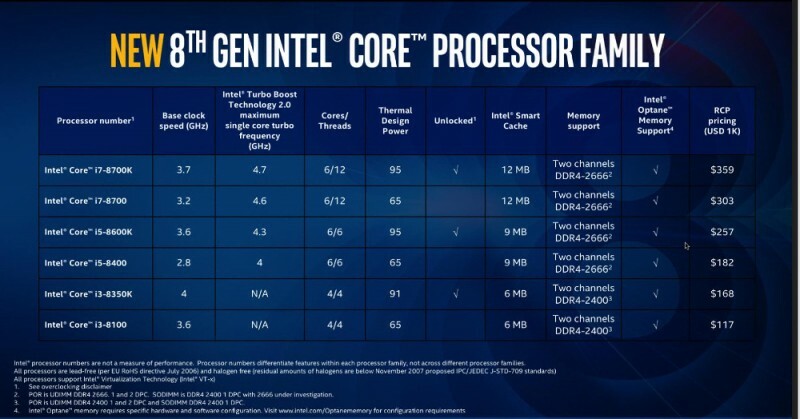 More information may be found on Intel’s 8th Gen Intel Core announcement page. This article originally appeared on LinuxGizmos.com on April 3. 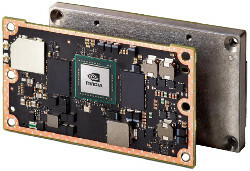 Innocomm announced a 50 mm x 50 mm “WB10” module with an NXP i.MX8M Quad SoC, 8 GB eMMC, Wi-Fi-ac, BT 4.2, GbE, HDMI 2.0 with 4K HDR and audio I/O including SAI, SPDIF and DSD512.Among the many embedded products announced in recent weeks that run NXP’s 1.5 GHz, Cortex-A53-based i.MX8M SoC, Innocomm’s 50 mm x 500 mm WB10 is one of the smallest. The top prize goes to Variscite’s SODIMM-style, 55 mm x 30 mm DART-MX8M. Like Emcraft’s 80 mm x 60mm i.MX 8M SOM, the home entertainment focused WB10 supports only the quad-core i.MX8M instead of the dual-core model. 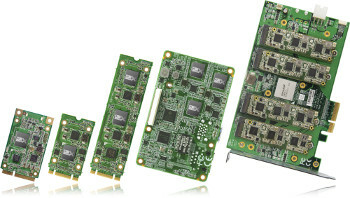 Other i.MX8M modules include Compulab’s 68 mm x 42mm CL-SOM-iMX8. (click images to enlarge)No OS support was listed, but all the other i.MX8M products we’ve seen have either run Linux or Linux and Android. The i.MX8M SoC incorporates a Vivante GC7000Lite GPU and VPU, enabling 4K HEVC/H265, H264, and VP9 video decoding with HDR. It also provides a 266MHz Cortex-M4 core for real-time tasks, as well as a security subsystem. 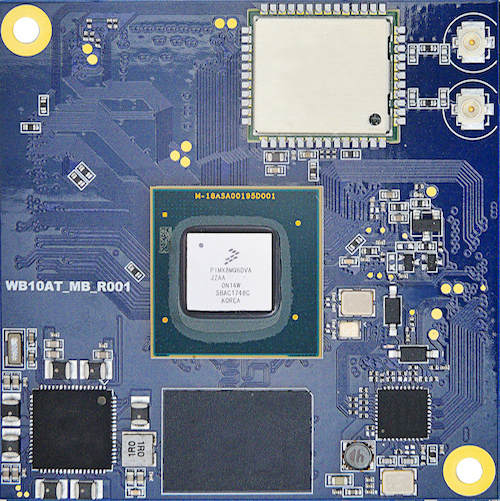 The WB10 module offers only 2 GB LPDDR4 instead of 4 GB for the other i.MX8M modules, and is also limited to 8GB eMMC. You do, however, get a GbE controller and onboard 802.11 a/b/g/n/ac with MIMO 2×2 and Bluetooth 4.2. The WB10 is designed for Internet audio, home entertainment, and smart speaker applications, and offers more than the usual audio interfaces. Media I/O expressed via its three 80-pin connectors include HDMI 2.0a with 4K and HDR support, as well as MIPI-DSI, 2x MIPI-CSI, SPDIF Rx/Tx, 4x SAI and the high-end DSD512 audio interface. No pricing or availability information was provided for the WB10. 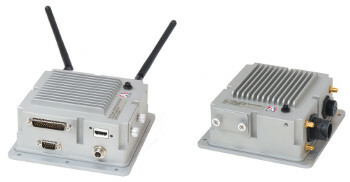 More information may be found on Innocomm’s WB10 product page. 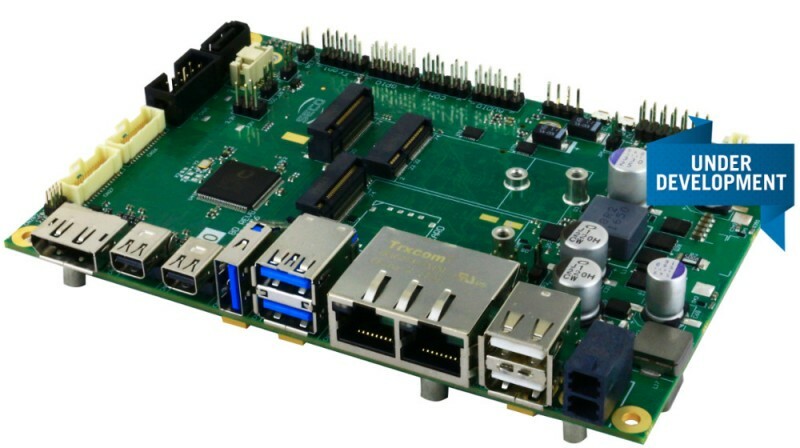 Commell has announced the LP-150, a Rockchip RK3128 based Pico-ITX SBC that appears to be its first ARM-based embedded board of any kind. 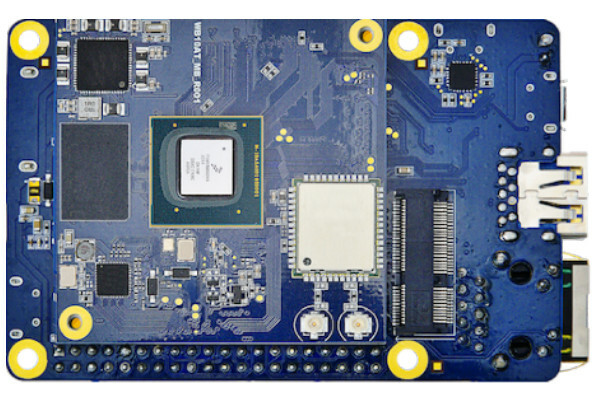 The 100 mm x 72 mm LP-150 is the only ARM-based SBC out of the many dozens of mostly Intel-based boards listed on Commell’s SBC page. Shipping with Android 4.4.4, but also supporting Linux, the LP-150 is intended primarily for imaging, machine vision and digital signage applications. 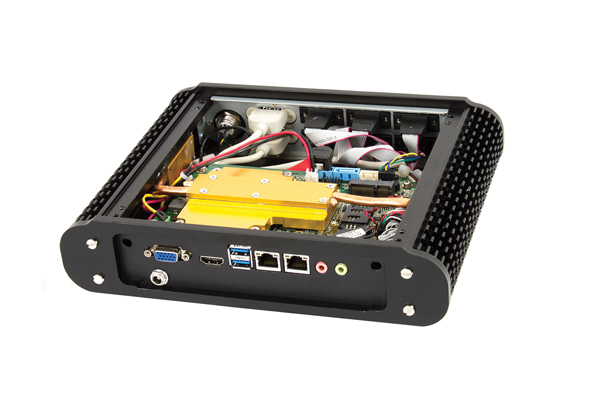 Other Commell Pico-ITX SBCs include its Intel Braswell based LP-176. Rockchip’s quad-core, Cortex-A7 RK3128 hasn’t seen as much uptake in the embedded world as the quad -A17 RK3288, which is found on hacker boards such as the Firefly-RK3288 Reload or the high-end, hexa-core RK3399, which has appeared on numerous recent products such as OpenEmbed’s em3399 module or Aaeon’s RICO-3399 PICO-ITX SBC. 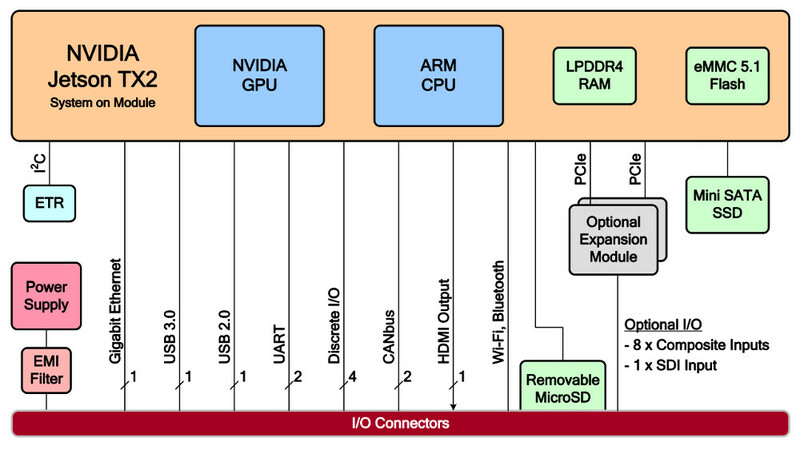 The only RK3128-based SBC we can recall is the open spec Firefly-FirePrime S.
The LP-150 SBC has a fairly modest feature set, with only 512 MB DDR3. Yet, it offers a few features you don’t typically find on x86 Pico-ITX SBCs like eMMC storage (8GB) and built-in Wi-Fi. Media features include an HDMI 1.4 port limited to HD resolution and an LVDS interface with capacitive touchscreen support. You also get CVBS inputs and outputs and audio I/O headers. The LP-150 is further equipped with a GbE port and USB 2.0 host and OTG ports. There is also an RTC with battery, and a smattering of RS-232, UART, and GPIO interfaces. No pricing or availability information was provided for the LP-150. More information may be found on Commell’s LP-150 product page. Newhaven Display has announced a new HDMI TFT module product line that greatly simplifies the process of connecting to the display. Rather than juggling an FPC ribbon cable with a middle-man controller board, you can connect an HDMI cable from your desired board or computer right into the TFT module. This makes it easy to interface with your display from the development and prototyping stages, all the way into final application production. The ease-of-use of these new products follows through into touch panel integration as well. For both the resistive and capacitive (PCAP) touch panel options, USB-HID driver recognition is installed. Each of the touch panel modules are also each pre-calibrated in-house to the display they’re mounted on. This means that a simple USB to micro-USB cable just needs to be connected from your board with touch interaction output (such as Raspberry Pi) to the module and your touch interactivity is ready to go immediately. 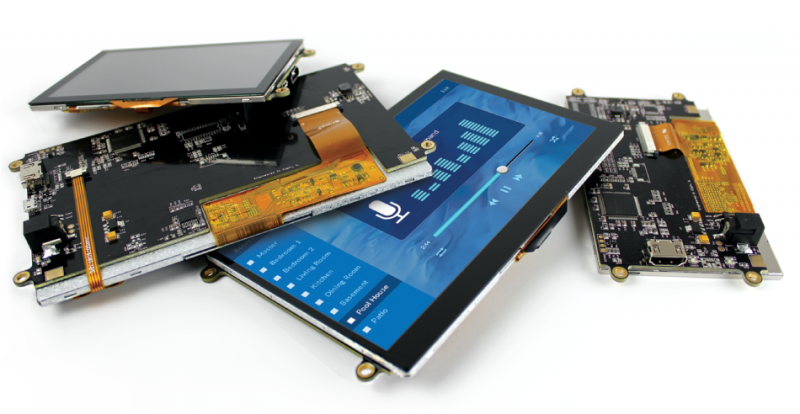 The product line is made up of three 5″ TFT modules and nine 7″ TFT modules. The 5” versions all come with MVA technology (meaning exceptional 75° viewing at all angles) and your choice of capacitive, resistive or no touch panel. The 7” modules have the same selection of touch screen options, but also allow you to choose between standard, premium or sunlight readable TFT displays. The boards that make up the new product line are Newhaven Displays’ own design and come with a number of features. On board DC power allows the display to perform at maximum capacity without worrying about a power supply bottleneck from elsewhere. The no-touch panel versions have just two simple connections required to get the module up and running, DC power and HDMI interface. The touch versions need an additional cable to utilize their touch functionality via USB-HID__three cables and you’re ready to go. 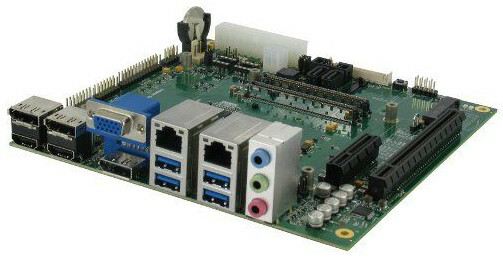 The hardware is compatible with PC systems (Windows or Linux) as well as Single-Board-Computers (SBCs) like the RaspberryPi and BeagleBone. The HDMI TFTs’ PCB boards also have four 3.5 mm mounting holes tooled right into the board itself–no bracket or casing required, just pop in any standard M3 screws. To ensure the highest quality and long-lasting performance, these modules use the reliable Texas Instruments TFP401A HDMI/DVI receiver and the TPS61165 LED driver. On the boards, you’ll also find a switch for Pulse Width Modulation (PWM) to control the brightness output from the display backlight. All hardware is completely open source and available as a useful reference point for any interested user. The wait for HDMI compatibility is over. Today is the day to start designing your projects with Newhaven Display’s new HDMI TFT Modules. Stop limiting yourself to the hassles of FPC cables and clunky controllers, just grab an HDMI cable and your set up is complete. It’s Newhaven Display’s product quality fused with the reliability of HDMI interface. 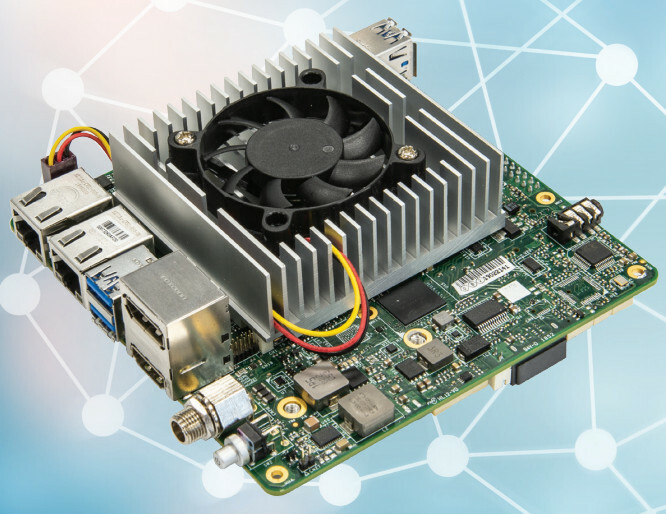 COMMELL has announced its LS-37K 3.5-inch embedded mini-board based on Intel 6th/7th generation FCLGA1151 Skylake / Kaby Lake Core processor family and Xeon E3-1200 v5 processor. The Skylake PC is claimed to deliver 30 percent better performance than a PC base on Ivy Bridge architecture, 20 percent better performance than a PC based on Haswell, and 10 percent better performance than a Broadwell PC. The LS-37K desktop 3.5-inch mini-board platform supports DDR4 memory DIMM 1866/2133 MHz up to 16 GB. The platform is based on Intel HD530 (Skylake) HD630, (Kaby Lake) and HD P530 (Xeon E3-1200v5). 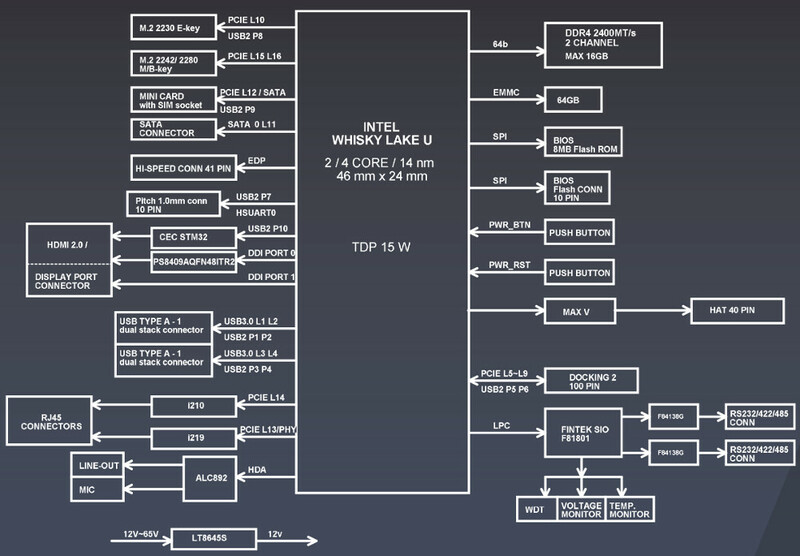 For graphics, the Skylake GPU offers 24 execution units (EUs) clocked at up to 1150Mhz (depending on the CPU model). The revised video engine now decodes H.265/HEVC completely in hardware and thereby much more efficiently than before, and HD Graphics 630 GPU is largely identical to the 530 found in Skylake, The only real upgrade here is the HEVC and VP9 support. LS-37K Displays can be connected via 1 VGA, 1 LVDS, 1 DVI, 1 HDMI and one DP port, up to three displays can be controlled simultaneously. LS-37K offers lots of features including high-speed data transfer interfaces such as 4 x USB3.0 and 2 x SATAIII, equipped with dual Gigabit Ethernet (One of the dual LAN with iAMT 11.0 supported), and comes with PS/2 port, 5 x RS232 and 1 x RS232/422/485, 4 x USB2.0, Intel® High Definition Audio, and 1 Mini PCIe socket (supporting mSATA) and 9 to 30 VDC input. The BIS-3922 improves on HABEY’s BIS-6922 system by offering additional I/O for more applications and solutions. The system is well suited for automation, digital signage, network security, point of sale, transportation, and digital surveillance applications. The BIS-3922 system includes six DB9 COM ports on the front panel, one of which supports RS-232/-422/-485. HABEY’s proprietary ICEFIN design ensures maximum heat dissipation and a true fanless system. The BIS-3922 system is built with the Intel QM77 chipset and is compatible with the third-generation Ivy Bridge Core processors. The BIS-3922 system’s additional features include a HM77 chipset that supports third-generation Intel Core i3/i5/i7 processors; dual gigabit Ethernet ports; High-Definition Multimedia Interface (HDMI), video graphics array (VGA), and low-voltage differential signaling (LVDS) display interfaces; one mini-PCI Express (PCIe) and one mSATA expansion; and a 3.5” single-board computer (SBC) form factor.